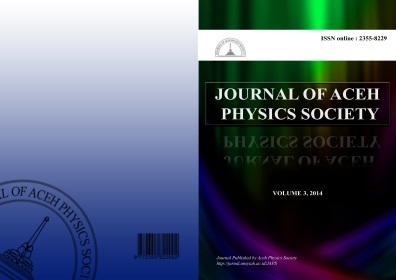 The Journal of Aceh Physics Society is a scientific journal owned and managed by Aceh Physics Society supported by Physics department, Universitas Syiah Kuala located in Indonesia. Journal of Aceh Physics Society (JAcPS) provides a forum for original paper works that enhances understanding of physics and their application. Paper related to the development of new experimental methods, visualization techniques, material physics, optic, laser and instrumentation in physics is an important part of this journal. Experience gained and lessons learned in building test facilities and in measuring and reducing test data are important aspect of any experimental work. Authors, who are undergraduated students of physics department of any Indonesian's University, are encouraged to report their experiences and to summarize the original data. Archival reviewed paper, short communication, invited papers, discussion of previously published papers, and book reviews are regular feature of the journal, in addition to full-length article.